Although Taiwan's population is only 2% the size of mainland China's, and its economy is equal to 6% of the mainland's GDP, a number of strategically-minded foreign asset managers have found remarkable success on the island, thanks to its open regulatory environment, solid economic fundamentals, and growing wealth. Taiwan's retail market in particular has fostered considerable success for offshore funds, which represent 60% of total mutual funds assets. BlackRock, Allianz, Fidelity, J.P. Morgan, and Amundi are among the major foreign players active in Taiwan's retail segment. "Taiwan is not typically seen as one of the 'giants' of Asia," says Alain Le Couédic, a Partner at Roland Berger and one of the authors of the study. "But its asset management market offers significant opportunities that others do not." The study credits Taiwan's attractiveness to a growing appetite for foreign assets, a large pool of relatively low-debt investors who hold most of their wealth in financial assets, and an asset management market that has grown 10% per year for the past six years straight. The study also finds that Taiwan's regulatory and competitive environment is more friendly than those of other regions or countries to foreign players that want to establish a footprint in Asia. As of 2012, 67 foreign managers were operating in Taiwan under various setups, of which 19 have a full range of offshore and onshore capabilities. Indeed, 8 of the top 10 retail players in Taiwan are foreign. Some recent developments present new challenges to foreign managers. New regulatory changes favor onshore retail, and local funds in Taiwan are consolidating into formidable competitors. 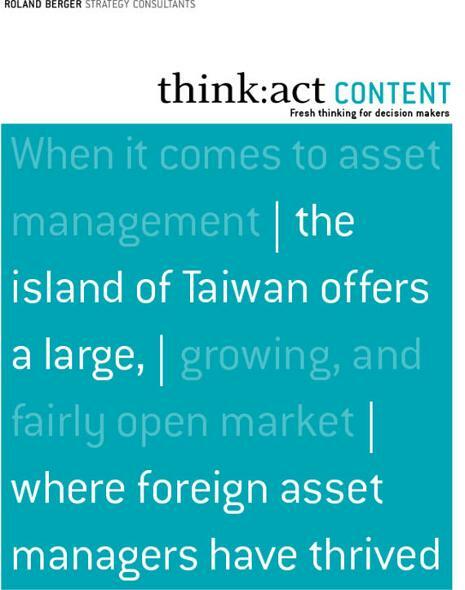 To meet these challenges, foreign asset managers must adopt a more complex, strategic approach to the Taiwanese market. To that end, the Roland Berger study recommends that foreign players take advantage of Taiwan's flexible setups to establish a limited local presence and then expand from there.